Model Builder The BioWin Model Builder provides the user with the ability to build a new model using existing state variables (including BioWin’s four User Defined Variables), or to enhance/modify/extend the BioWin ASDM model. 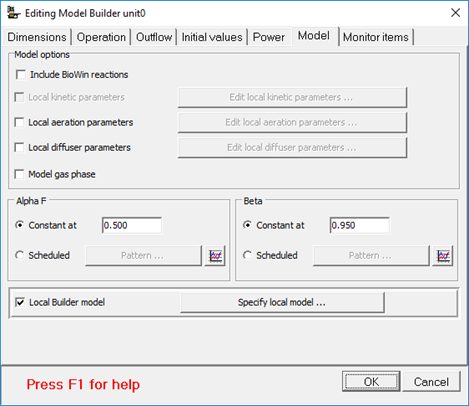 The model builder may be invoked and applied on a local basis by clicking the Specify local model… button (if the Local Builder model option is selected) on the Model tab of the Model builder element. Alternatively, the model builder may be invoked and applied on a global basis by selecting the Model builder… command from the Project menu. BioWin’s Model Builder editor interface is shown in Figure 1. It is used to enter stoichiometry and kinetic rate equations (along with stoichiometry and rate constants) for user-defined models. Figure 1. Model Builder editor interface. The user can input the name and notes relating to the user-defined model in the Model Name and Notes fields, respectively. As the # of processes field is changed, the number of rows of the model matrix will expand to allow the user to enter processes which act on the BioWin state variables and the corresponding stoichiometric and kinetic relationships. 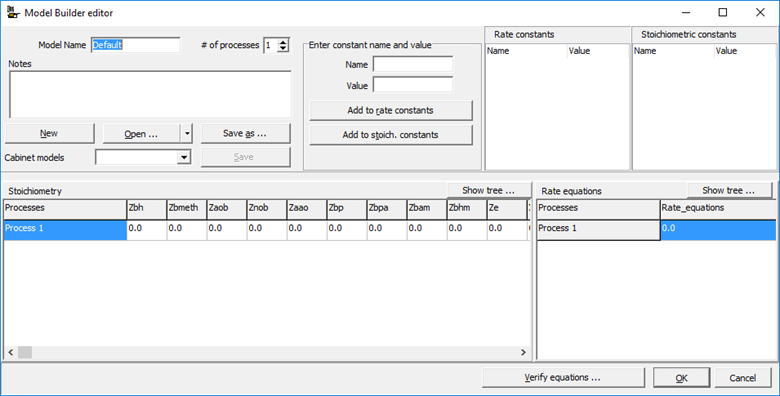 A powerful equation editor is available for editing stoichiometric and rate equations by double-clicking in either a stoichiometry or rate equation field. 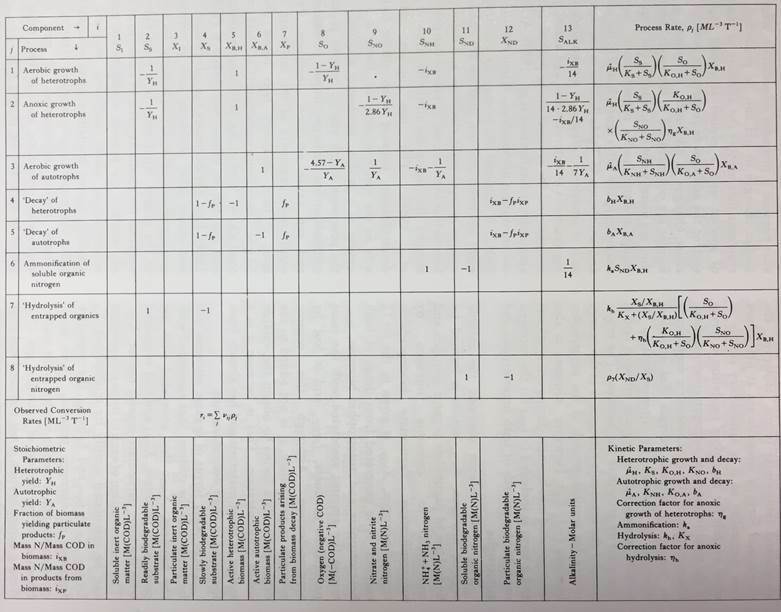 All the stoichiometry constants utilized in the stoichiometric relationship between state variables in each process and the rate constants utilized in the rate equations should be defined. These are input using the Name and Value fields under Enter constant name and value heading. After inputting the Name and Value of each constant, the user needs to click either the Add to rate constants or Add to stoich. constants buttons to categorize the constant. The user-defined models that you create can be either project-specific (i.e. they are available only within the project where they were created), or you may save them in “.mod” files to be used in other BioWin projects. Model builder elements that you place in your configuration, provided those models do not override this by using a Local Builder model. You can also have individual models that are local to a particular model builder element (select the Local Builder model option on the Model tab). Elements that include reactions if you select Use project Model Builder model from the Project | Current Project Options | Model tab (Figure2). If you create a model using the Specify local model… button on the Model tab of a model builder element, then that model will only be used by that model builder element (Figure 3). Once you have created a model, either in the Project | Model Builder… or through Specify local model… you can save it using the Save or Save as buttons as appropriate. Saving a model allows you to Open a model in any project, or model builder element. A number of Builder models are shipped with BioWin. You can access these by opening the Model Builder (by selecting Project | Model builder… from the main BioWin window). Within the model builder interface there is a Cabinet models drop down list; to load a model click the arrow to reveal the list and then click the model you want to use. A model loaded from the Cabinet models list can be edited and saved in the normal fashion; this does not impact the underlying template model file (unless you specifically overwrite the template model). Activated Sludge Model No. 1 (ASM 1) was developed and published by a Task Group of the International Association on Water Pollution Research and Control (IAWPRC), the predecessor of the International Water Association (IWA) (Henze et al., 1987). It is a simple model and is used for teaching and in some cases for model development. The ASM1 matrix is shown in Figure 4. Tip: It can be very helpful for the user to organize the developed model in a matrix such as Figure 4 in a spreadsheet before input to the Model Builder. This approach facilitates checking of model mass balances for each process, etc. ASM 1 includes 13 state variables and 8 processes. 12 of the 13 state variables are also used by BioWin’s ASDM model, although they are named differently. The user only needs to find the corresponding state variables in BioWin and directly use them. The 12 state variables that are used in BioWin ASDM and ASM 1 are listed in Table 1. The 13th variable of ASM 1 is alkalinity, the capacity of the solution to buffer acid. BioWin does not use alkalinity as a state variable; rather, BioWin calculates pH and alkalinity based on charge and ion balances. Therefore, when the user wants to implement the ASM 1 in BioWin, a User Defined Variable has to be used for the alkalinity. At present, BioWin contains 53 state variables including four User Defined Variables. The definition and naming of those variables can be found in BioWin’s user manual in the Model reference > Definition of Combined Variables section. BioWin has four user defined variables and UD1 and UD2 have units of mg/L. UD3 and UD4 have units of mgVSS/L and mgTSS/L, respectively. In this example, UD1 is used to represent alkalinity. Tip: There’s no User Defined Variable with a unit of mmol/L or meq/L in BioWin. UD1 and UD2 are variables representing soluble components. To use UD1 to represent alkalinity, the user either assumes it is the alkalinity equivalent in the unit of mmol/L (i.e. BioWin’s unit basis for reporting alkalinity) or needs to multiply the alkalinity equivalent by 50 to convert it to units of mgCaCO3/L. The original published ASM 1 uses the unit of mmol/L for alkalinity so that convention is followed by this example. From the ASM 1 matrix (Figure 4), the user can summarize all the stoichiometric and rate constants needed to define the model. 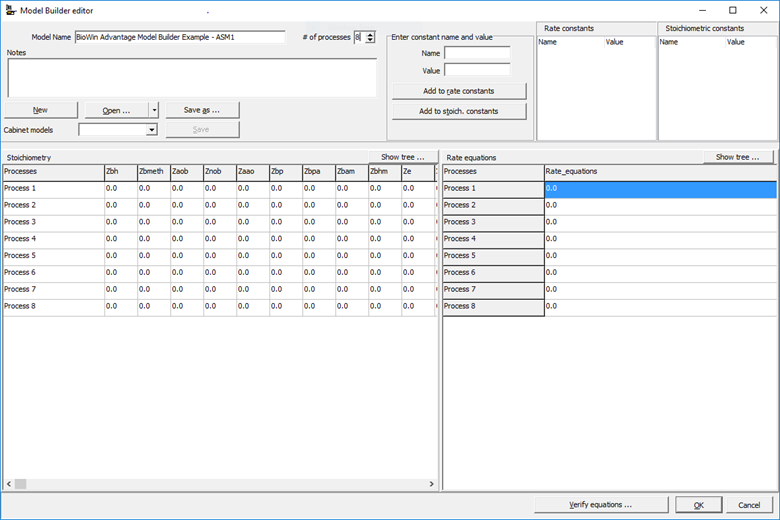 The Model Builder editor allows the user to input the Name and Value of a pre-defined constant. Tip: Remember to click the button of Add to rate constants or Add to stoich. constants after inputting or modifying the constant to add/update it to the corresponding categories. The user can name the model, for example, “BioWin Advantage Model Builder Example – ASM 1” and set up the # of processes (Figure 5). Figure 5. Expand the Stoichiometry matrix and Rate_equations. Once the stoichiometric relationship is defined, the user needs to input the stoichiometric coefficients from the above equation into the cells under the corresponding state variables. Recall that UD1 will be used to represent SAlk. Tip: The state variables on the left side of the equation will be consumed in the process so when the user inputs their stoichiometric coefficients into the matrix, a negative sign should be added. The user can double-click each cell of the stoichiometric matrix to invoke the Equation Editor to input the stoichiometric coefficient one-by-one. Alternatively, if the stoichiometric expression is not complex the user can click once in the cell to edit it and directly type in the equation. In this example, we will input “1”, “-1/Y_OHO”, “-i_N_Bio”, “(1-Y_OHO)/Y_OHO”, and “-i_N_Bio/14” under the state variables Zbh, Sbsc, NH3-N, DO, and UD1, respectively, for the process we have named “Aerobic growth of heterotrophs”. More details about editing in the Equation Editor will be introduced in Step 4. Figure 6. Incorrect multiplication syntax. Figure 7. Correct multiplication syntax. Figure 8. Equation editor right-click popup menu. Figure 9. State variable selection window. To place a variable from this list into your current equation, simply locate the variable in the list and double-click it. The popup window will close, and you will return to your equation, where you will see that the variable has been placed where you had located your cursor. To close a popup window without adding an item to your equation, click the small x located in the upper right corner of the popup window. 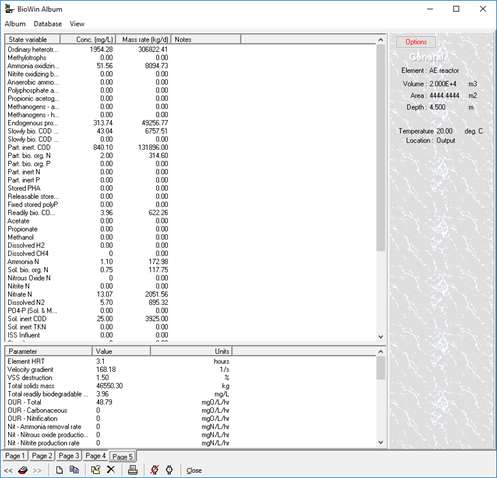 When the user double-clicks an item to add it to the equation, BioWin also adds the item to the Windows clipboard. Pressing Ctrl+v will add the item to the equation at another point if desired, until another item is added to the clipboard. Selecting the Rate constant option (when opening the equation editor from a stoichiometry cell) opens a window that lists the rate constants that the user has defined for the model. Selecting the Function / operator option opens a window that lists a number of function / operator templates that the user may place in the equation. To place a function or operator from this list into the current equation, simply locate the function or operator in the list and double-click it. The popup window will close, and the user will return to the equation, where the function or operator template has been placed at the cursor. Figure 10. Function/ operator selection window. Right-click the blank area of the Equation editor, select Function/ operator, and select Monod(TD(RateAt20; Theta; Temp), Substrate; Ks). Type in an asterisk character for the multiplication operator, and then right-click, select Function/ operator, and select Conc Swtich Ks. Repeat to insert another Conc Swtich Ks. Highlight the text RateAt20, right-click, select Rate constant, and select the pre-defined rate constant for the maximum growth rate mu_OHO to replace RateAt20. Similarly, replace Theta with the pre-defined rate constant theta_muOHO and Ks with the pre-defined rate constant K_SB_OHO. Highlight Substate, right-click, select Variable, and select Sbsc to replace Substrate. To define the DO switch, highlight Conc, right-click, select Variable and select DO. Highlight Ks, right-click, select Rate constant, and select the pre-defined rate constant for the maximum growth rate K_O2_OHO. The updated equation is shown below. To define the NH3 switch, highlight Conc, right-click, select Variable and select NH3N. Highlight Ks, right-click, select Rate constant, and select the pre-defined rate constant for the maximum growth rate K_NHx_OHO. The updated equation is shown below. During the edition of the formula, the user can use the Set position to button to quickly move the cursor around within the Equation editor. The position refers to the number of spaces from the left (or beginning) of a line of text. To exit the equation editor and accept the changes you have made, the user should click the Close and update button. To exit the equation editor without accepting the changes you have made, the user just clicks the small x in the upper right hand corner of the equation editor window. As the user enters equations in the model, they should use the Verify equations… button to ensure that there are no mistakes in the equations. When the user clicks this button, BioWin checks the equations for undeclared variables and constants (rate and stoichiometric). 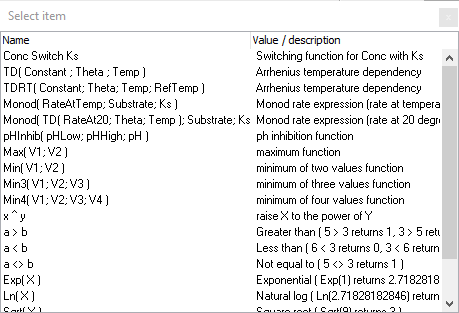 BioWin also checks the equations for the proper syntax (e.g. missing multiplication operators). Finally, BioWin attempts to calculate the model equations. This may be useful in discovering equation formula errors such as division by zero. After verifying the model equations, click OK to close the Model Builder Editor window and save the created model in the current BioWin file. 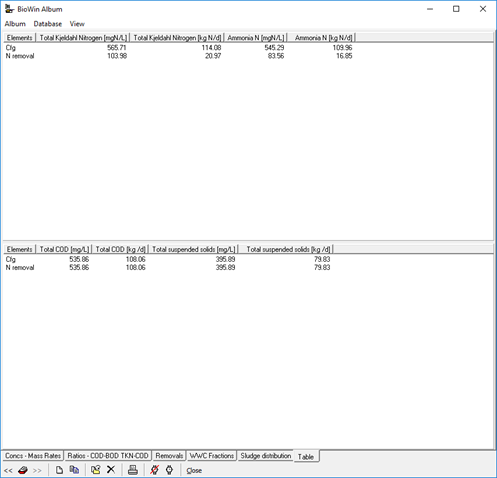 If the user wants to load this model in different BioWin files, they can save the developed model on the computer in a “.mod” file. In this example, the developed model is saved as ASM1Ex.mod. Using a regular BioWin influent adds unnecessary complexity for ASM 1 utilization, because it includes many state variables not recognized by ASM1. Furthermore, the alkalinity represented by UD1 is not included in a regular BioWin influent. BioWin’ State Variable Influent element is ideal for creating an ASM1-compatible influent. For detailed information on the State Variable Influent element, readers are referred to the Influent (State Variable) section of the BioWin manual chapter entitled Element Types. The basic concept is that this element allows the user to specify an influent in terms of model state variables. This facility allows the creation of an influent that consists only of components acted upon by ASM 1. Below is an example influent file that accompanies this document. To apply the Model Builder model ASM 1, the user has to turn off BioWin’s default ASDM model. 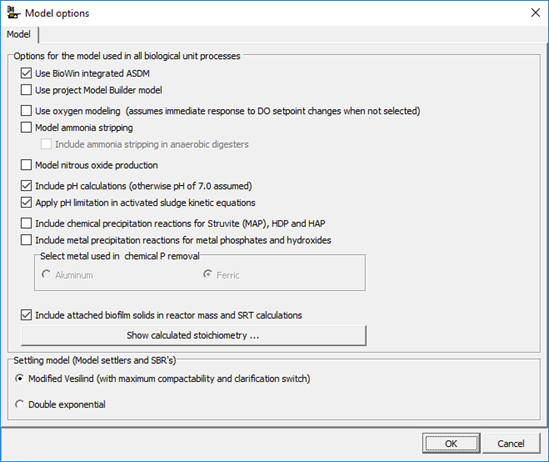 Click the “Model options…” button in the left bottom corner of the main BioWin window, check the box labelled User project Model Builder model and uncheck the boxes labelled Use BioWin integrated ASDM, Include pH calculations and Apply pH limitation in activated sludge kinetic equations. pH and alkalinity calculations in the default BioWin model are not applicable when the user-defined ASM1 model is used because the ASM1 model does not have the capability of pH calculation and alkalinity is considered as a state variable rather than a result of water chemistry. Therefore, the user should ignore pH values reported by BioWin when using the user-defined ASM1 model. 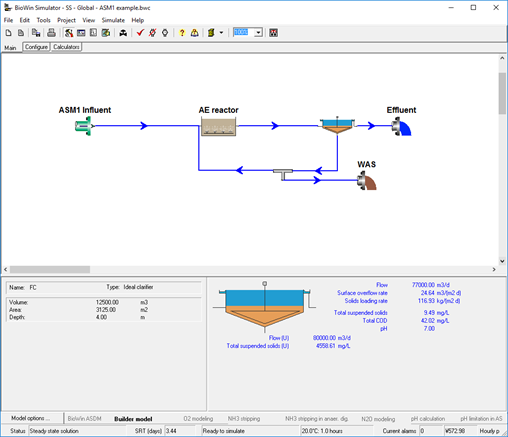 The following configuration shows a conventional activated sludge process set up in BioWin. ASM 1 was used for its simulation. The influent components listed in Table 2 were used. Figure 11. A single reactor system with constant input. The system is set up to waste at a constant rate to give a system SRT of 3.44 days. A summary view of the steady state solution is shown below. Figure 12. State variable values at the steady state condition for the single reactor system with constant input. 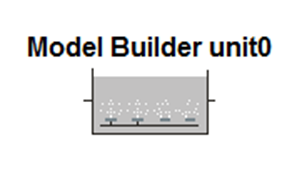 The Model Builder model can be applied locally in Model Builder units if desired, as shown in the Figure 13 below. In this way, the user does not need to check Use project Model Builder model under Model options, but rather load the ASM1Ex.mod in the Model Builder unit. The simulations results are the same as the results shown in 3.3.1. Figure 13. A single reactor system using Model Builder unit. In some cases, the underlying mechanics of a treatment element (say for a chemical or physical treatment process acting on specific components) are not well understood and no model has been developed to describe it. The user may still want to include this element in a whole-plant BioWin model, but is only interested in the percentage removal of the specific components. In this case, a “black box” model can be developed and applied locally for this element using the Model Builder unit. The BioWin file “Full plant with sidestream N removal – blk box model” illustrates an example of applying a black box model to approximate a percentage removal of specific compounds. The configuration is shown below in Figure 14. Figure 14. 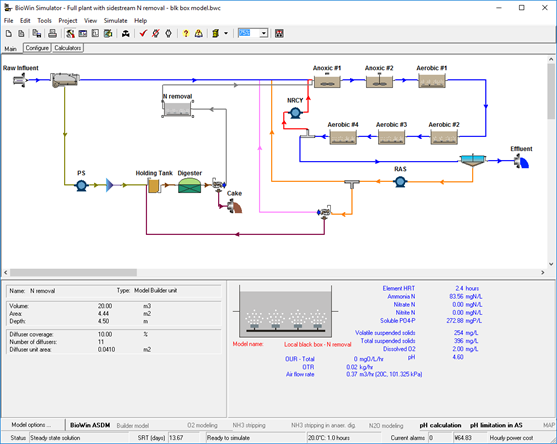 Full plant simulation with a black box model unit for sidestream N removal. The wastewater treatment plant configuration includes an MLE (or A/O) process for mainstream nitrogen removal, anaerobic digestion for primary and secondary sludge treatment, and a sidestream treatment process for ammonia removal from the centrate of the digester. 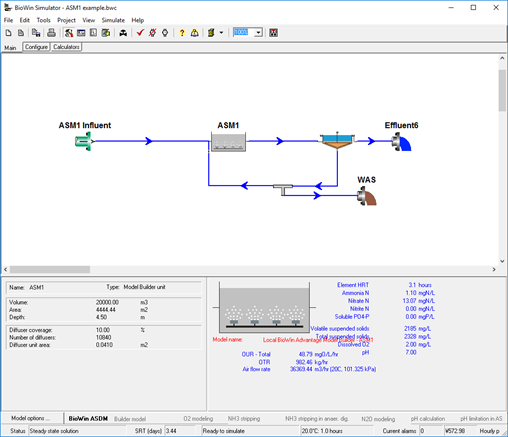 In this example, the actual sidestream treatment process has not been specified, but the user wanted to explore the impact of implementing a process that would achieve about 85% ammonia removal. A “black box” model was developed with only one process for ammonia removal. The stoichiometric relationship is simple: -1 for NH3N. Note that there won’t be a mass balance for N since ammonia will just “disappear”. The rate equation is formed to achieve the expected percentage removal. A Monod-form rate is used so the user has two rate constants, the maximum removal rate R_NH3 and the half-saturation coefficient ks_NH3, to tune the removal rate. Figure 15. The “black box” model for sidestream N removal. The results are shown in the following Figure 16. The ammonia removal is (545.29 – 83.56)/545.29 = 84.7%, consistent with the user’s expectation. Since only one process is included in the model for ammonia removal, all the other components in the centrate are not touched. Figure 16 also shows the total COD and TSS of the centrate maintain the same values through the Model Builder unit. Figure 16. The results of the sidestream N removal element. Obviously, the “black box” model is not predictive. The model structure and parameter values are specified for the current element (influent loading, reactor size, removal percentage, etc.) and should be double-checked if the operation condition and percentage removal of the element are changed.